By 1950, the noir film had moved from heavily chiaroscuro, brooding tales of killers and detectives towards a flatter, more authoritarian style narrated by stentorian voices and presenting documentary-like action in real locations. 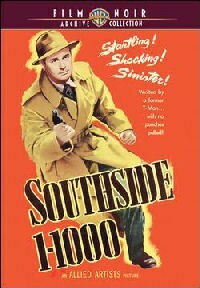 Southside 1-000 is a particularly low-budget example of this, with seemingly half the running time spent extolling the work of the Treasury Department in tracking down counterfeiters in a dedicated, no-nonsense fashion. Our bland T-man hero (Don DeFore, later the genial paterfamilias of TV's Hazel) ingratiates himself with a foxy but bitter young woman (Andrea King) involved in the counterfeit ring, and this leads to the movie's expressionistic climax amid the geometries of concrete railroad bridges. Along the way we see various old-time Los Angeles locales, like the Angels Flight streetcar (there's better footage of this in The Indestructible Man, but we digress). While acceptable enough as it goes along, this is an unnecessary and forgettable entry in the genre, and that's disappointing because it's the only other noir exercise directed by Boris Ingster, a European immigrant whose lavishly dreamlike low-budgeter The Stranger on the Third Floor is one of Hollywood's seminal examples of early noir.